August 2, 2011 by Venky. A Fixed Gear Bike? No Coasting? Why??? “A fixie? No coasting? Why?” That is a standard question I keep hearing. When people keep asking the same question, I tend to ask myself and wonder, why!? The first time I wondered about it myself was when Krishna Mandava, my good friend from Hyderabad posed this question. 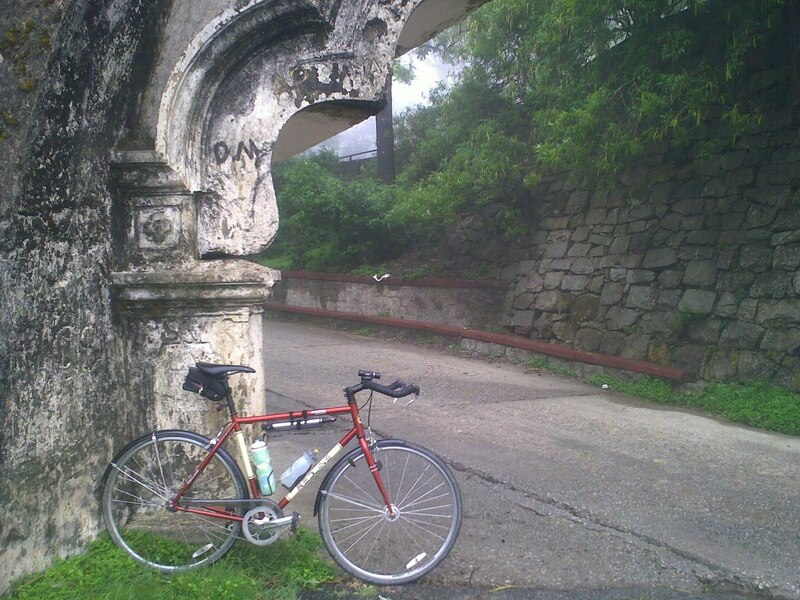 He asked on our mailing list, “Venky, tell us something about what prompted you to go for a fixed wheel, how you planned to have one and how could you realize the dream.” This was when I shared the excitement of my first fixed gear century. My answer to that was this: “Its not like I had a dream that I realized by buying this bike. But, its more of a fascination with fixed gear concept ever since I saw one. 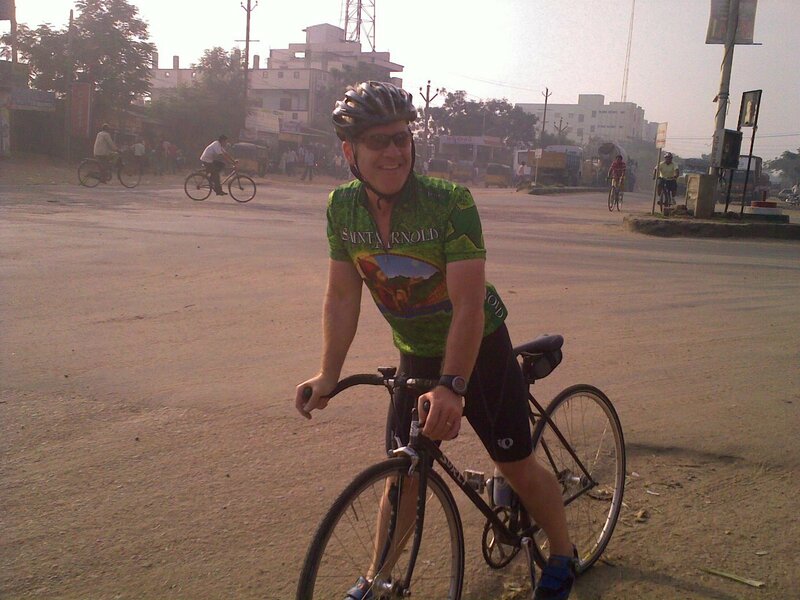 The first fixed gear bike I ever saw was when our own ‘Iron man’ Matt came riding on one for, ‘Tea at Shamshabad‘ ride on August 29th 2009. I kept seeing him ride that Surly fixed gear bike from time to time and was really amazed and curious at the same time. Matt on his fixed gear bike. Notice the bullhorn bars. Then by the time of my last ride with HBC last year before coming here(I was in US at the time of this communication), our own Sandy got a fixed gear bike too. It was a nice lemon yellow Schwinn Madison. I guess, the seeds of curiosity were sown by seeing those bikes of Matt and Sandy and wondering how the heck can they ride a bike that does not allow you to coast? It was more of a fascination that remained dormant in the recesses of the mind. 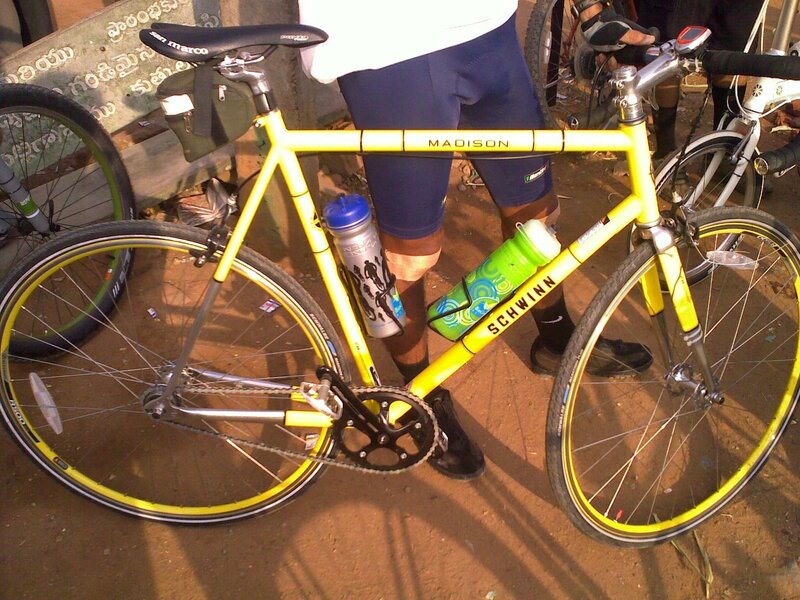 When I chanced upon this bike(The Bulldog) on the 1st of this month(May 2010) for what looked like a pretty good deal, that dormant fascination refused to remain dormant any further and forced me to buy the bike. That reply pretty much sums up how I ended up leaning towards a fixed gear bike. My Bulldog on top of Nandi on its second visit there. It doesn’t have fenders now..
An Ideal Commute Bike. Right? When I initially looked at it and was considering buying it, I thought it would be a perfect commute bike for the flat terrain of Hyderabad. It had a chain guard, fenders and eyelets for racks too. Ideally the things we look for on a commuter. But the more I rode the Bulldog, in the hilly terrain of Vermont, the more I loved the way it rode. I didn’t really want to restrict such a good bike to just commutes. Also, my plan of buying either a Bianchi Volpe or a Surly Crosscheck didn’t quite materialize before I came back from the US because of various reasons. Now, I simply cannot afford buying another bike and the Bulldog keeps me going just fine. In fact, I love riding it. So, I continue to ride it. What are the benefits you see in riding a fixed gear bike as opposed to a normal road bike? All this climbing on the Bulldog, is it not bad for your knees? You need double the effort to ride a fixed gear bike. Right? I really don’t care what the benefits are apart from the obvious one, no coasting. This article by Sheldon Brown might help people who want to know its benefits. This article might explain the other aspects of what might bewitch a fixed gear rider. But, for me, it just feels good. It is easier and more enjoyable to ride than any other bike I own. So, in a way, I ride it because its easier to ride and not because I see/seek any benefits from riding a fixed gear bike or because I want people to think that I’m a tough guy(Well, may be, I do). Well, I think it is because it all began in Vermont. At the time I bought the Bulldog, I was riding an MTB that I built from frame up. While I built that MTB because I wanted to get out and ride even in Vermont winter, I didn’t like riding an MTB on road after the winter was gone. Around that time, I had signed up for my first 100 mile bike ride along with a team at work. I hated the prospect of riding the 100 miles on the MTB. So, since I started enjoying riding the Bulldog, I thought why not ride the Prouty on it! It also looked incredibly challenging at that time. When that thought came to my mind, the first thing I did was to check the elevation profile of the Prouty route. I saw one decent hill. I figured that I have to learn to climb well if I were to complete the 100 miles. So, I began riding all my practice rides on it and some of them were decent climbs. Although I suffered while actually climbing, the feeling of accomplishment was really heady after the fact. I guess it is that heady feeling, the satisfaction the ego gets after a challenging climb, that got me hooked. I began to love climbing. I never approached any climb for the first time thinking I will conquer it but with a question in mind, ‘will I be able to do it?’. Most of the times, the answer was a satisfying ‘yes’ after much toil, but for one time. But almost every time, without fail, I learn something about myself in the process when I’m climbing. Climbing: Bad For Knees! No? To answer the concerned questions of my well wishers who think that all the climbing could harm my knees, I honestly think that I don’t over do the climbing. At least not after coming back from Vermont. If I average it out, I didn’t even do one major climb per a month of owning the Bulldog. I don’t think I will do that either. I think even if I did one hard climb in a month, the body would be able to take it as it will get enough time to recover and rebuild. Please point out if this thinking is faulty. I don’t want to injure myself in the process of satisfying my ego by pursuing mindlessly challenging climbs. I want to keep riding well into my grand kids’ time. Now, I don’t really give much thought to the fixed gear aspect of it. I ride it like a ‘normal’ bike, which it is! Seriously! The max speed of the bulldog on your first century ride was 64 kmph. I wonder what your cadence was at that point! Must be hard to keep up although downhills are easy. I feel nothing gives you greater control over the bike than a fixie! Nice post as usual, Venky. 🙂 One thing I don't understand – you said that it's easier to ride the fixie. What do you mean easier? Effort-wise (because of the lack of derailleur that reduces efficiency)? Or just the process of riding (no thinking, changing gears, etc)? 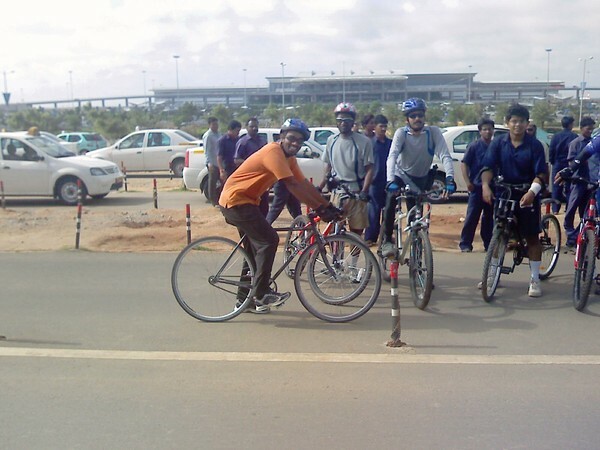 Abhijit, What I mean by being easier is that it is definitely the easiest to ride among the bikes that I own. I didn't ride any other road bikes for any long duration of time to comment. But, I think, the lighter carbon bikes with smooth components would be definitely easier to ride and mostly compensate for the efficiency due to lack of derailleur pulleys etc on a Fixed gear bike pointed out by Sheldon. But if you give me a basic geared bike of similar weight to my fixed gear bike, I think, I would prefer riding the Bulldog. This I'm talking about on flat roads, rolling terrain or moderate climbs. With it, I don't need to use any mental energy trying to decide on which gear I need to be in to climb efficiently. I can just put down my foot and tackle that little hill without thinking too much and probably do it quicker than if I were on a geared bike. Nice blog and up to date. Where can I buy fixie bikes in India? There is nothing incorrect with the numeral of bikes you own. whilst you could read your blog to evoke recollections you might just as with no trouble look at the bikes and revive those moments in instance. I think you should resolve the matter by getting a better residence.